© 2009-2018 Bracebridge Generation Ltd. All rights reserved. Parry Sound District is advising area residents that a Flood Watch is in effect in the District, which includes the District Municipality of Muskoka, the Territorial District of Parry Sound and a north-west portion of the County of Haliburton, until Wednesday, April 24, 2019. Hydroelectric power generation has occurred on the Seguin River watershed since the late 1800’s. The existing Cascade Street GS has been in operation since 2017. There are presently eleven water control structures within the Seguin River watershed. Cascade Street Generating Station is the only waterpower facility on the watershed and is located near the mouth of the Seguin River flowing into Georgian Bay in the Town of Parry Sound. The watershed is a drainage area of 1034 km² with the headwaters on the western slopes of the Algonquin Dome near the hamlet of Whitehall, and flow westerly for a distance of approximately 40 km to Parry Sound Harbour at Parry Sound and ultimately to Georgian Bay. • Annual precipitation includes more than 300 cm of snowfall, typically representing about 25% of the annual wet precipitation amount. • Lake evaporation is an important consideration during extended dry periods in the summer when flows are reduced, compounding the reduction in lake levels. Watershed Location: This generating station / dam is located near the mouth of the Seguin River flowing into Georgian Bay in the Town of Parry Sound. It controls a drainage area of 1034 km². Structural Characteristics: The dam is made up of concrete with weirs, 4 stoplog spillways and 2 sluice gates. In addition to his sawmills, Beatty had a grist mill built on the north side of the Sequin River, south of the Cascade Street Bridge: the same property that the present powerhouse occupies. In 1896 it was converted into Parry’s Sound’s first power plant. The mill was outfitted with two 75 kilowatt monocycle alternators which produced 2,300 volts at 60 hertz. These were installed in such a manner that they could be run by water power, or by steam when the river was being used for log driving by local lumber companies. Watershed Location: This dam is located at the mouth of the Seguin River flowing into Georgian Bay in the Town of Parry Sound. It controls a drainage area of 1040 km². Structural Characteristics: The dam is made up of 3 concrete weirs with 2 stoplog spillways. Watershed Location: This dam is located in Monteith Township. It controls a drainage area of 119 km². Structural Characteristics: The dam is made up of 2 stoplog spillways with overflow weir abutments to shore. Watershed Location: This dam is located in McKellar Township. It controls a drainage area of 41 km². Structural Characteristics: The dam is made up of 1 stoplog spillway with overflow weir abutments to shore. Watershed Location: This dam is located in McDougall Township. It controls a drainage area of 41 km². Watershed Location: This dam is located in Ferguson Township. It controls a drainage area of 26 km². Watershed Location: This dam is located in Monteith Township. It controls a drainage area of 40 km². Watershed Location: This dam is located in McKellar Township. It controls a drainage area of 411 km² and Manitouwabing Lake. Structural Characteristics: The dam is made up of 4 stoplog spillways. Watershed Location: This dam is located in Christie Township. It controls a drainage area of 24 km². Structural Characteristics: The dam is made up of 1 stoplog spillway. 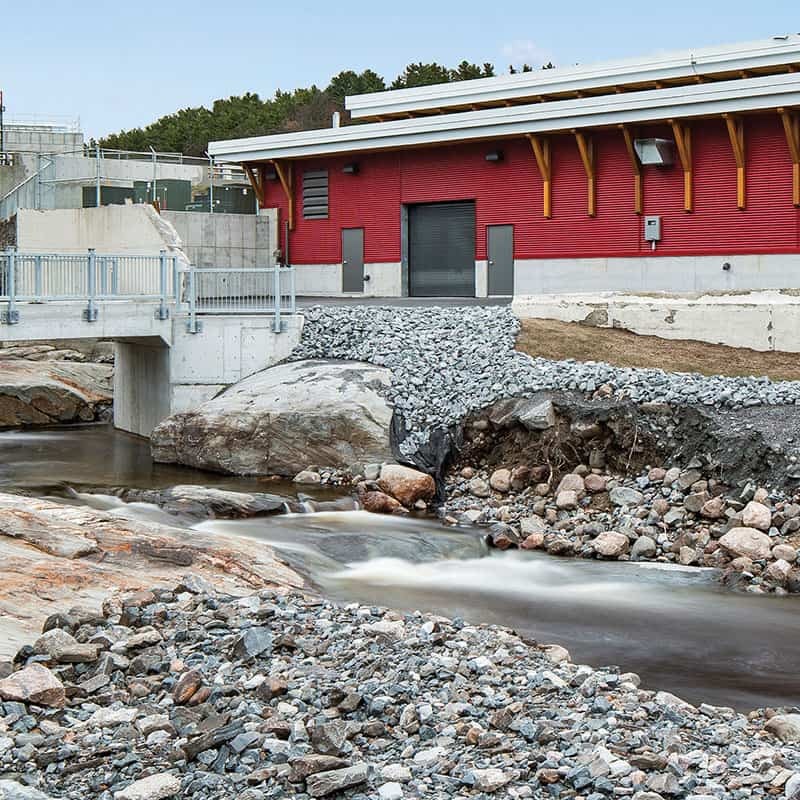 Watershed Location: This dam is located in the Town of Parry Sound. It controls a drainage area of 1029 km². Structural Characteristics: The dam is made up of 4 stoplog spillways with overflow weirs. Watershed Location: This dam is located in Humphrey Township. It controls a drainage area of 21 km². Structural Characteristics: The dam is made up of 1 stoplog spillways with overflow weir abutments to shore.